Review: Ari Mitchell is just like any other teenage girl who, feeling she doesn't fit in, dons an invisibility cloak at her Brooklyn high school. She goes through the motions, but never seems to quite be the person that people will notice - unlike her best friend Summer. She's perfect and confident - every boy's dream. Ari's life takes a turn though when an unexpected inheritance has her attending Summer's school, an elite Manhattan prep school. 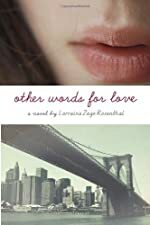 Other Words for Love, written by Lorraine Zago Rosenthal is a heart-felt story of Ari's late teen years as she transforms from her mother's perfect daughter to the young woman she wants to be. Ari is trapped. She's trapped in a complex friendship with Summer who has a full social life of her own, but who knows she is Ari's only real friend and resents her reaching out for more friends. She's trapped in a family where her older sister has been a disappointment to her mother by getting pregnant at young age and who is struggling with depression as she has her second child. And she's trapped in love. When Ari transfers to the Manhattan school, she feels completely alone. Summer has her circle of friends there, and Ari has no one - that is until she meets Leigh. Leigh is another outcast who lives a life of luxury with private drivers, night clubs, and black tie parties. Through a common interest in art, Leigh and Ari become friends, and Leigh opens Ari's eyes to a completely new world - and Summer is not thrilled. At one of the many parties, Ari meets Blake, Leigh's gorgeous cousin. Ari finds out there is so much more to life than what she'd imagined as she and Blake fall in love. But, while one part of Ari's life has taken off, another part comes crumbling down. Her sister falls into a serious depression, and her mother makes it more and more clear that Ari is expected to be the perfect daughter she didn't have with her sister. As Ari struggles with her family, her friendship with Summer, and a growing distance from Leigh, Blake's life takes a turn and he pulls away as well. Ari must find some way to pick up all the pieces and move forward, but sometimes that seems impossible. Other Words for Love has all the components of a good teen novel. The friendship struggles Ari faces are common struggles for all girls. As Ari draws closer to Leigh, Summer pulls further and further away. Ari must face the fact that part of their friendship was based on the power Summer feels in being her only friend. And as Ari and Blake develop in their relationship, Leigh feels abandoned and draws away. That horrible struggle between friends and relationships is a common occurrence in a teen's life. Also, the family dynamics are compelling. Ari's mother is completely overprotective trying to hold a family together on her own, while her sister's life is a mess. Ari's father is in the home, but is so distant that she barely feels his support. She sums up her relationship with her dad when she reflects on seeing him holding his grandson. "That was what depressed me the most. More than the messy house and the puking and the snot. It depressed me because I only got that from Dad once, on a summer day when I was six years old. . . . he scooped me up and told me in a soothing voice that everything was okay until I believed him. That was the one and only time." But through all this, Ari is expected to be the one to make the right decisions, do the right things, get into a good college. As her world crumbles around her, Rosenthal shows Ari's struggle for identity and search for hope. The lessons she learns are priceless. We would like to thank Random House for providing a copy of Other Words for Love for this review. Have you read Other Words for Love? How would you rate it?